The Glorious Mysteries - My Catholic Life! Scripture: But on the first day of the week, at early dawn, they came to the tomb, taking the spices that they had prepared. They found the stone rolled away from the tomb, but when they went in, they did not find the body. While they were perplexed about this, suddenly two men in dazzling clothes stood beside them. The women were terrified and bowed their faces to the ground, but the men said to them, “Why do you look for the living among the dead? He is not here, but has risen. Remember how he told you, while he was still in Galilee, that the Son of Man must be handed over to sinners, and be crucified, and on the third day rise again.” Then they remembered his words, and returning from the tomb, they told all this to the eleven and to all the rest.Now it was Mary Magdalene, Joanna, Mary the mother of James, and the other women with them who told this to the apostles. But these words seemed to them an idle tale, and they did not believe them. 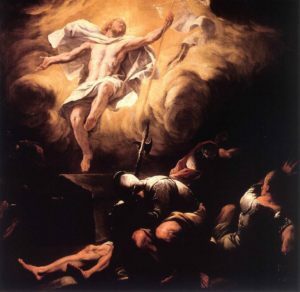 But Peter got up and ran to the tomb; stooping and looking in, he saw the linen cloths by themselves; then he went home, amazed at what had happened (Luke 24:1-12). Scripture: So when they had come together, they asked him, “Lord, is this the time when you will restore the kingdom to Israel?” He replied, “It is not for you to know the times or periods that the Father has set by his own authority. But you will receive power when the Holy Spirit has come upon you; and you will be my witnesses in Jerusalem, in all Judea and Samaria, and to the ends of the earth.” When he had said this, as they were watching, he was lifted up, and a cloud took him out of their sight. While he was going and they were gazing up toward heaven, suddenly two men in white robes stood by them. They said, “Men of Galilee, why do you stand looking up toward heaven? This Jesus, who has been taken up from you into heaven, will come in the same way as you saw him go into heaven” (Acts 1:6-11). 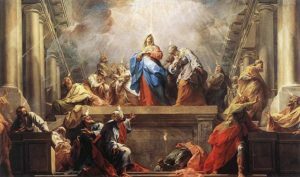 Scripture: When the day of Pentecost had come, they were all together in one place. And suddenly from heaven there came a sound like the rush of a violent wind, and it filled the entire house where they were sitting. Divided tongues, as of fire, appeared among them, and a tongue rested on each of them. All of them were filled with the Holy Spirit and began to speak in other languages, as the Spirit gave them ability (Acts 2:1-4). 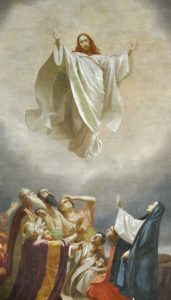 Dogma of the Assumption: For which reason, after we have poured forth prayers of supplication again and again to God, and have invoked the light of the Spirit of Truth, for the glory of Almighty God who has lavished his special affection upon the Virgin Mary, for the honor of her Son, the immortal King of the Ages and the Victor over sin and death, for the increase of the glory of that same august Mother, and for the joy and exultation of the entire Church; by the authority of our Lord Jesus Christ, of the Blessed Apostles Peter and Paul, and by our own authority, we pronounce, declare, and define it to be a divinely revealed dogma: that the Immaculate Mother of God, the ever Virgin Mary, having completed the course of her earthly life, was assumed body and soul into heavenly glory (MUNIFICENTISSIMUS DEUS #44). 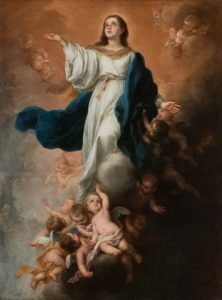 Scripture: A great sign appeared in heaven: a woman clothed with the sun, with the moon under her feet, and on her head a crown of twelve stars. She was pregnant and was crying out in birth pangs, in the agony of giving birth. Then another portent appeared in heaven: a great red dragon, with seven heads and ten horns, and seven diadems on his heads. His tail swept down a third of the stars of heaven and threw them to the earth. Then the dragon stood before the woman who was about to bear a child, so that he might devour her child as soon as it was born. 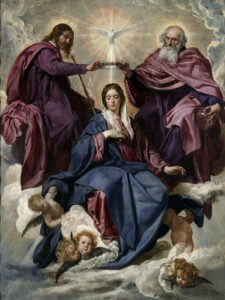 And she gave birth to a son, a male child, who is to rule all the nations with a rod of iron. But her child was snatched away and taken to God and to his throne; and the woman fled into the wilderness, where she has a place prepared by God, so that there she can be nourished for one thousand two hundred sixty days (Revelations 12:1). The New Revised Standard Version Bible is approved for use in English by the Catholic Church and is used, in part, for the Scripture quotes of the Catechism of the Catholic Church.